MTV, once a youth music powerhouse, is now a house brand! Coles-Myer has licensed the MTV brand and you'll find it in your local Coles supermarket applied to a broad range of otherwise "generic" CDs, DVDs, cassettes, cheap AM/FM radios, headphones, and other accessories. Yep, the subject of numerous business school and textbook case studies now takes its place not in the brand pantheon alongside Virgin, Microsoft and Apple, but rather in the bottom of the shopping trolley with Coles' "Farmland", "Savings" and "Reliance". Globally, under new leadership, MTV is supposed to be trying to recapture its "cool" (see Business Week). I can't see how allowing its name and logo to be used on cheap, supermarket-grade consumer electronics and accessories could possibly help the MTV brand. But I can see lots of risks: there's evidence already that consumers are finding fault with the quality of MTV-branded recordable CDs and DVDs, and transferring that association to the MTV brand overall (see this consumer forum). Of course, in Australia, MTV never achieved the heights of popularity or supposed cultural influence it did in the US or even in Europe and Asia, and it has a long history of being represented here as a licensed property rather than making its own way. Indeed, MTV was introduced in Australia in 1987 as late-night weekend programming on the free-to-air Nine Network (low-rent airtime previously occupied by the likes of Deadly Earnest, Hal Todd and Issi Dye). 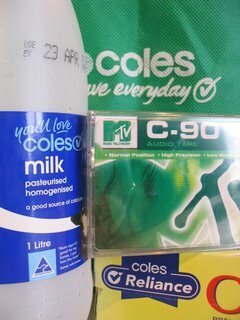 With Richard Wilkins as the host and face of MTV Australia, it was always mainstream and highly-processed - pretty suitable for the supermarket aisles, when you come to think about it. But this move down market seems particularly bizarre given that MTV now has a lot at stake in Australia with its own wholly-owned cable channel and stiff competition from the home-grown Channel V. There's nothing particularly "cool" about Coles (other than the frozen food section).